When I started homebrewing, I bottled every batch. 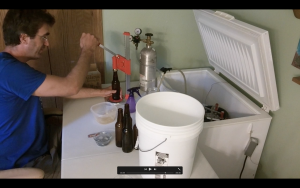 Like many home brewers, things changed when I got everything needed to set up a keg system and a co2 tank. The only problem is that occasionally I need to take a small quantity of beer somewhere. While the Blichmann Beer Gun is great for bottling beer for long-term storage, many times I need something fast. It doesn’t get much faster and easier than using a bottling wand in the picnic tap already attached to your keg. How do you fill bottles on short notice or quickly? Please post below.